Ever since Truman’s closed the brewery in 1988 after more than three centuries of brewing in Brick Lane, their absence has been felt throughout East London, emphasised by all the ex-Truman’s pubs that are still emblazoned with the name as part of their architecture. 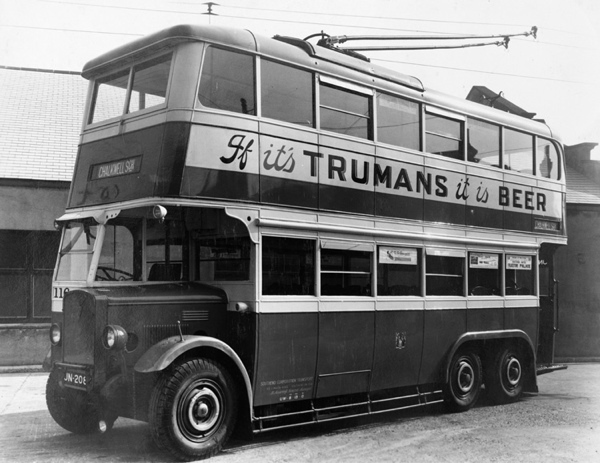 Meanwhile, the venerable history and resonant name of Truman’s – which remains synonymous with beer in East London – got lost in series of corporate takeovers at the end of the last century. They were sorely missed. And it looked like it was all over, the barrel was empty, the last glass had been drunk and the dregs had been drained. But now, in an entirely unexpected joyous development, two fearless young men are bringing Truman’s back. 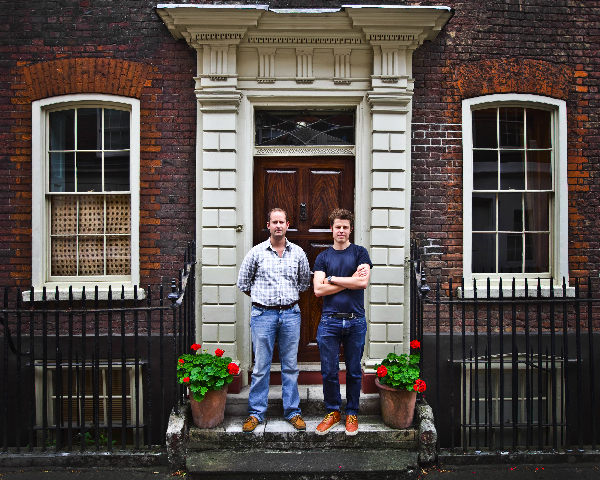 “It was apparent that everyone referred to Truman’s, but you couldn’t taste it – so it was a sad story,” explained Michael-George Hemus who, with his business partner James Morgan, has embraced the audacious challenge to re-establish Truman’s Brewery, working from an attic in Elder St. “There is a legacy of Truman’s that has to be taken up by a brewery of a certain size.” said James with an impressive clear-eyed confidence, declaring his ambition to open a brewery in East London, on a scale than can employ a significant number of people, within two years from now. If Michael-George & James are successful they will become one more chapter in the long history that has seen many re-inventions for Truman’s Brewery. As Michael-George reminded me, Joseph Truman who gave his name to the brewery was not the one who started it, but an employee who worked his way up and took over the business. 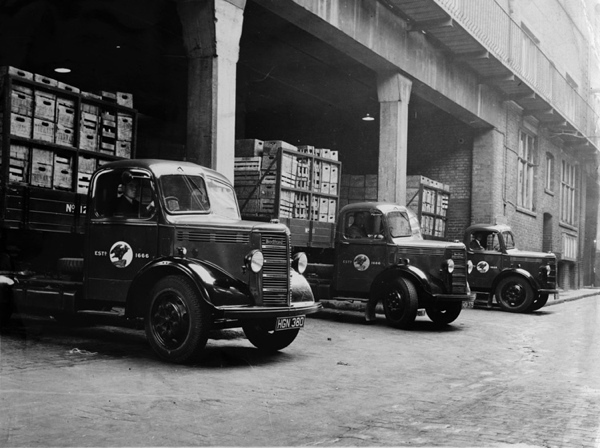 Joseph’s son Ben was in charge during the porter boom, building the business to become the largest brewer in East London, exporting overseas, supplying the army, the royal family and creating an imperial stout for the Tsar. 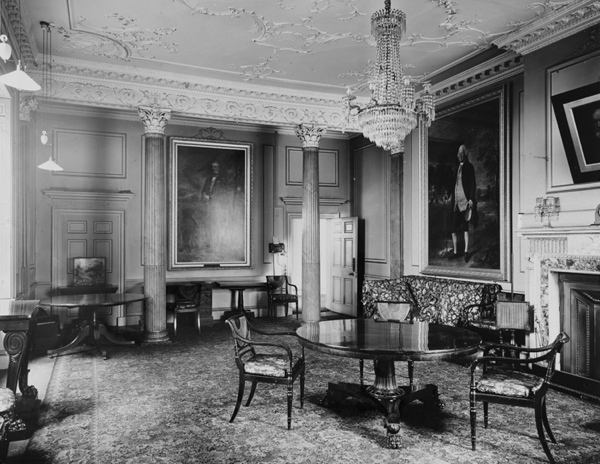 When Ben Truman died without an heir, Sampson Hanbury bought up all the shares and took control. 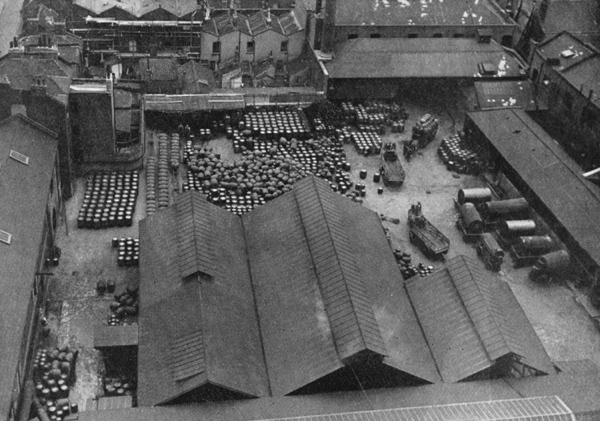 Industrialising the process, he was one of the first to use canals for distribution and bought a boat to ship his own exports. His successor Thomas Buxton was William Wilberforce’s right hand man in the campaign for abolition of slavery, who worked altruistically for the people of the East End, insisting all his employees learn to read on company time. So Michael-George & James are following in the footsteps of some remarkable men, and last December, after two years of wrangling, they signed an agreement to buy the celebrated yet neglected name of Truman’s from the corporate owners. 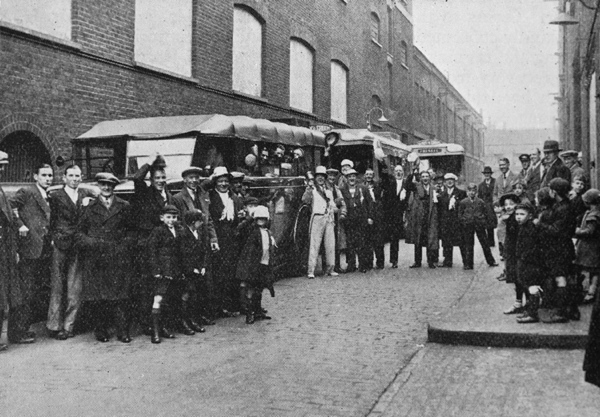 But since November, they had already been stealing a march in the London Metropolitan Archive which houses all Truman’s records, researching the history of their illustrious predecessors, poring through the photographic collection and most significantly studying the “gyle books” which contain the recipes for beer. Stretching from 1812 until the nineteen twenties, these volumes specify the crucial factors, namely the time of day, the weather and the ingredients for every brew. Before it was possible to store hops or malted barley, as it is today, achieving a consistent brew was almost impossible, so brewers blended beers – creating large vats of strong barley wine and carefully blending it proportionally with something weaker to produce a consistency of taste. Michael-George & James boldly decided to launch their first beer at once, as a means to build up a sales volume that would allow them to open a brewery that matches their ambitions. “We thought about recreating an old recipe, but decided against it because we don’t want this to be a nostalgic project, it’s Truman’s for the twenty-first century.” said Michael-George, emphasising that they do not wish to wind the clock backwards. “We wanted a beer that everyone can drink, because that’s what Truman’s is about,“ added James optimistically, stressing the nature of Truman’s as a popular beer, not just for real ale drinkers. Working with esteemed brewer Tom Knox of Nethergate brewery and in consultation with former Truman’s employees, such as Derek Prentice who was a junior brewer from 1968 until 1989 in Brick Lane, they set to work. 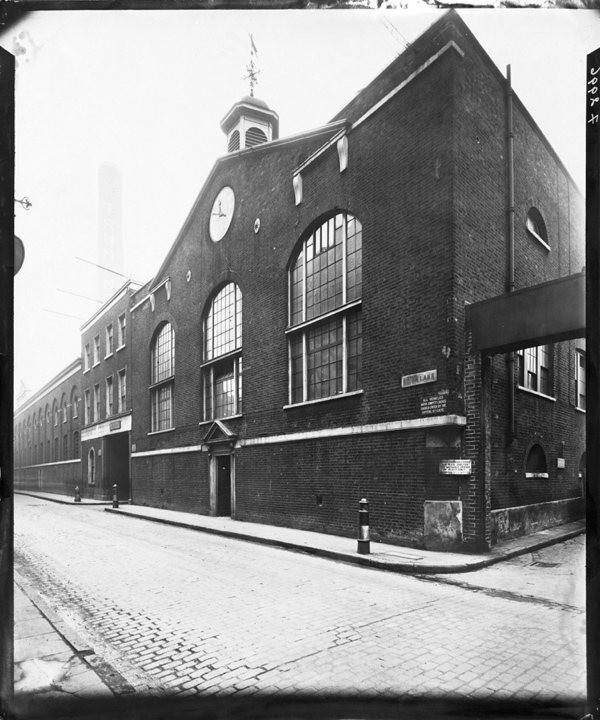 The beers brewed in Spitalfields tended to be darker, and so, in opposition to the current fashion for lighter beers, they chose to create a darker beer in the best bitter style, christened “Runner,” meaning the staple brew. A decision that informed the choice of malts, which were Maris Otter pale malt, chocolate malt, crystal rye, wheat and a little dark crystal rye, complimented by a blend of two traditional British hop varieties Fuggles and Goldings. Let me confess, these were mysterious terms to me, but it was a parching afternoon and I could sense a certain relish in the cadences that Michael-George adopted as he rolled these names off his tongue.“We tried about thirty until we worked out what we liked,” he admitted, in explanation of their research process, exchanging a glance of barely concealed glee with James.“It is a four per cent alcohol best bitter, darker than fashionable, though traditionally well bodied, full rounded, and which drinks stronger than it is.” announced James authoritatively, looking thirsty suddenly as he let these words overcome him, in the process of summing up their debut beer with the precise rhetoric of a professional brewer. You may be assured that I shall follow this story of the return of Truman’s closely over the coming years, but in the meantime you can try a glass of Truman’s Runner for yourself – because it is already available in the East End. I must admit to having enjoyed a few pints of this delicious bitter myself last week at The Carpenter’s Arms in Cheshire St. You can also find it at The Water Poet in Folgate St, The Griffin in Leonard St, The Haggerston in Dalston, Indo in Whitechapel, The Scolt Head in De Beauvoir Town and The Wenlock Arms in Hoxton, with many more others to follow in time. Cheers! Setting out for on inter-brewery football tournament. 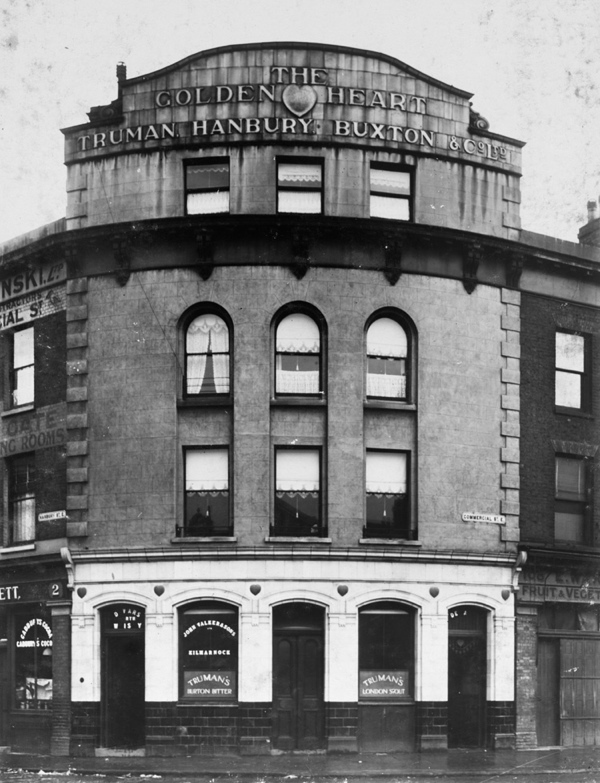 The Golden Heart, Commercial St, Spitalfields, in its previous incarnation. 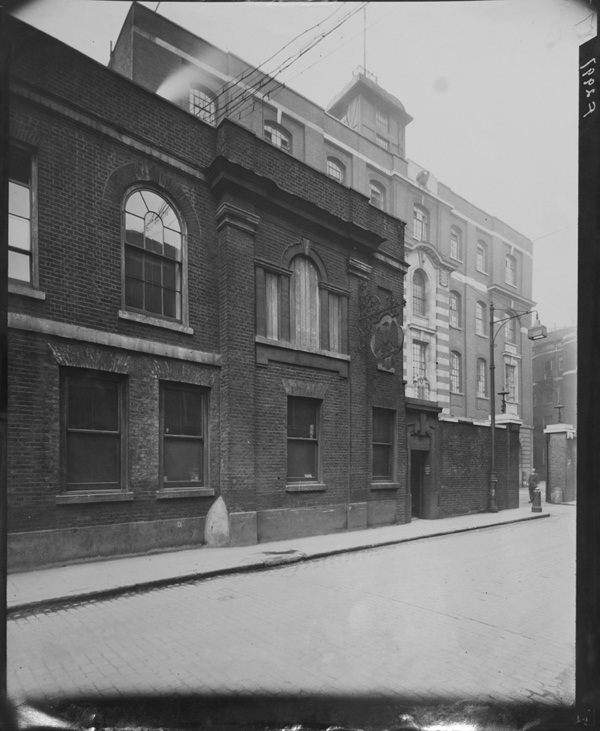 This is so interesting to me – my great grandfather was some sort of manager at Trumans on Brick Lane in the middle of the last century. I am so happy to see that someone is going to resurrect Trumans Brewery. I worked for Trumans for over twenty years, First as a Chauffeur to the Directors, then as a Security Officer until the takeover by Grand Met when I became redundent. I was sad to see the old Brewery close down, which must have been very sad for all the employees that became redundent. I still receive a pension from Trumans (now Diageo). Although I am an OAP, I would be very happy to help in any way that I can. WOW….great stuff guys…my Grandad was head of security at Trumans til 1978 and he often snuck me in for visits so exciting for a ten yr old…the photos bring back so many memeries and I’ll def by buying a new Trumans pint in his honour..
Amazing stuff guys…..fond memories as my Grandad was head of security for Trumans until 1978…he used to sneak me in on Sundays for a tour….very exciting for ten yr old….lol. My mum says she remembers them building the Chimney and all the kids were trying to work out what the word was going to be on it. This would have been in the 40s. hi amazing my granddad came from the east-end and my gran was from ireland and my dad is Michael Joseph Truman . funny I have a brother James Truman and a son Ben truman hillarious coincidence. would love to taste a pint of Truman beer. I am traveling to London for the first time Spring 2012. I have been searching the internet memorabilia/artifacts from the Truman Brewery without success. Do such items exist? Any help would be greatly appreciated. cant belive the draywalk is now full of shops + stalls !! my grandad, dad, and uncle worked here for years, im a photographer doing an exhibition on trumans and street life in the 1960/70,s. can anyone give me advice where to get infrmation on the trumans brewery life? photos?interviews. Used to love the smell of the beer brewing. I grew up on the smell of Truman’s. My uncle ran a series of Truman’s pubs and I used to ‘help’ him in the cellar. When I grew up I had a go at running a Truman’s pub but by that time it was all Watney’s keg-fizz-p*ss. Disillusioned I became a teacher instead. My GGGGGrandfather lived at 1. Pelhap Street (Halifax Estates) around the corner from the brewery. His name was George Frederick Truman. Do any others have relatives that were Truman’s and lived in the area. Would like to hear from you. 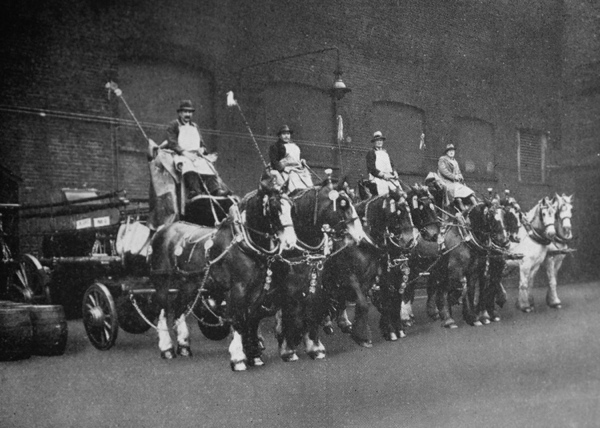 I used to live in a Trumans pub in Bishopsgate opposite Spitalfields market and the horse drawn cart used to bring my dads beer ever week. I used to ask the drayman can I sit on the horses but obviously I was not allowed. I used to give the horses carrots or sugar lumps while they were waiting for the drayman to put the beer down into the cellar. The drayman were like old friends as you got to see them ever week and they were very professional at there job. 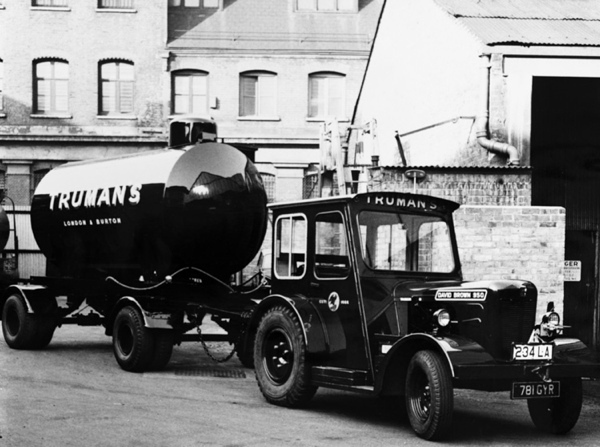 Practically all my family worked at Trumans..my Nan Anne Mahon was head of bottling, she used to wear wooden clogs in the 50s/60s…numeorous family members also my dad Ray McNulty, uncles Fred Balbi, Stevie Matthews, Great Uncle Fred Garrett, my nan’s sister Rita Garrett also (they then went on to run the Jack The Ripper pub (back to orginal name now Ten Bells) on Commercial Street. They used to have amazing beanos/days out/parties etc for all staff. My nan kept all the annual books that they gave staff – I have put them away safe keeping – they contain numerous photographs/stories/company info etc. Everyone always said the people were GREAT and the times they had there were GREAT. I also worked there the last year before it shut down 1989 I was a schoolgirl and got a 6 week summer job there in the Stores – inputting data of all the stock. 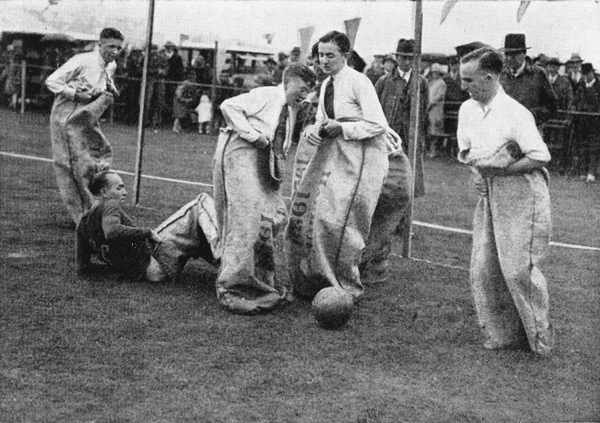 ood wages too for a schoolgirl – got my wagepacket on a Thursday and would be out then!!! ?bung surround? and a strange brass valve/tap. My aged mother once said her Dad and a colleague at the brewery designed and patented some kind of valve/tap. Whether this thing I’ve got is such a device…. I don’t know. i was curious to see if Truman’s rebirth was successful. As of t0day, 18/3/18 their website looks like they’ve made it. Will definitely try to visit next time I’m in London. I believe my great grandfather George Stiff (or Steff) was the head groom at Truman’s around 19oo. Does anyone have any information that may substantiate this? 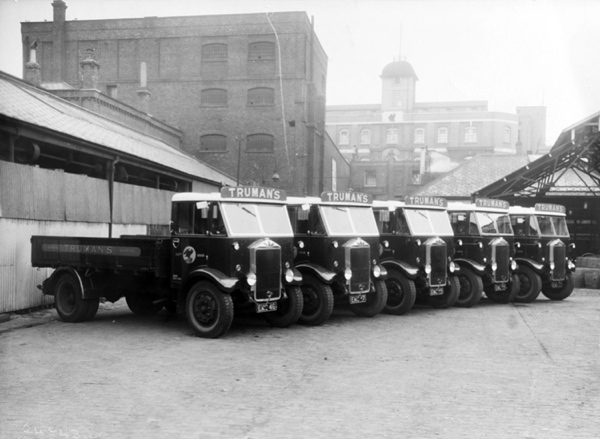 I have a picture of the three drays,automatic Dodges, we operated and the guys then plus we were picked to be used in the Grand Met magazine of which l have a copy of the picture where we were delivering to a pub in Mountnessing Essex ,we waxed and polished that dray for days for a half hour photo shoot but she looked great.